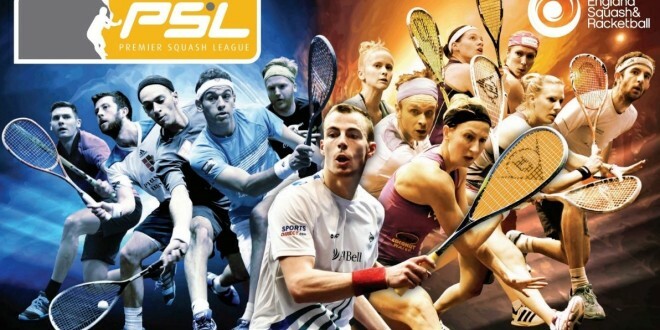 The world’s most prestigious squash league starts its 32nd season on Tuesday 6th October when the 2015/16 season of the England Squash & Racketball Premier Squash League (PSL) gets under way with the first of ten rounds of League matches. 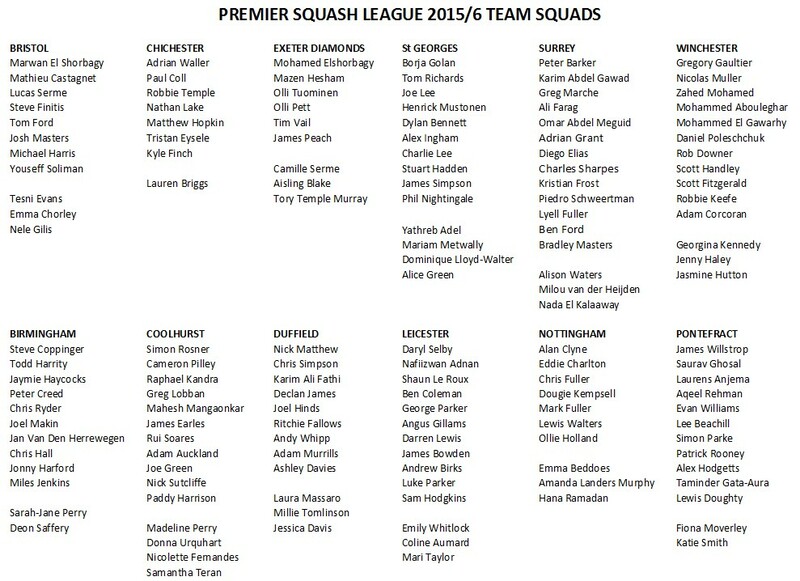 There will once more be twelve clubs from around the UK competing for the title in an unchanged lineup , with the squads between them boasting 15 of the Men’s world top 20 players (and 33 of the top 50) and 9 of the Women’s world top 30. 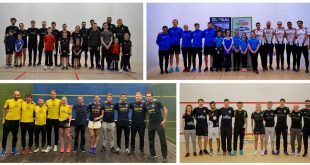 In Group A defending champions Benz Bavarian Duffield start off their defence with a home tie against Midland rivals Air-It Nottingham, Everards Leicester begin their second season with a home match against last season’s semi-finalists Coolhurst London, while Pontefract entertain Birmingham University. 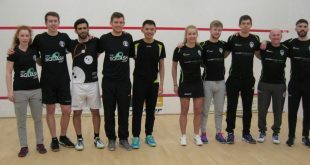 In Group B Virgin Active Surrey HRC, whose five-season winning streak was ended by Duffield in last year’s semi-final, start with a home match against Exeter Diamonds. 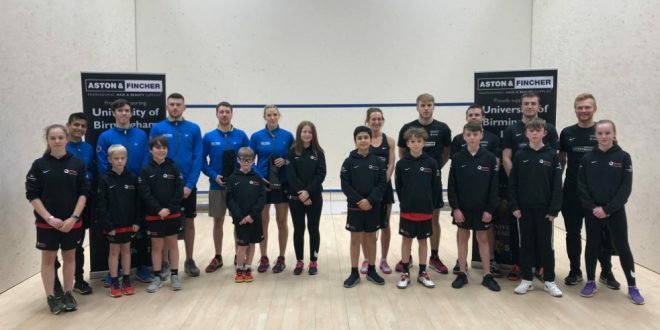 Last season’s runners-up Nine Telecom St George’s, again relying on mainly home-grown talent, travel to UWE/Elite Squash Bristol while Team Chichester welcome visitors ClubNet Winchester. 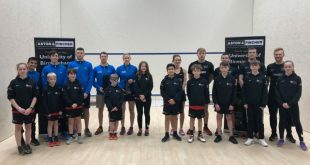 England Squash & Racketball Head of Competitions and Events Chris Nutley said: “I am delighted that we have maintained a full complement of teams once again. 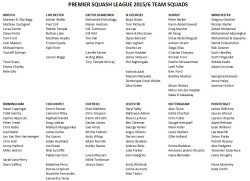 After Tuesday’s first round there is a two week break, with the remaining first half rounds to be played on 27th Oct, 10th and 24th November and 8th December (all Tuesdays with matches starting at 19.00). After all ten rounds are completed (second half dated to be set later in the year) the top two teams in each Group will contest the semi-finals.